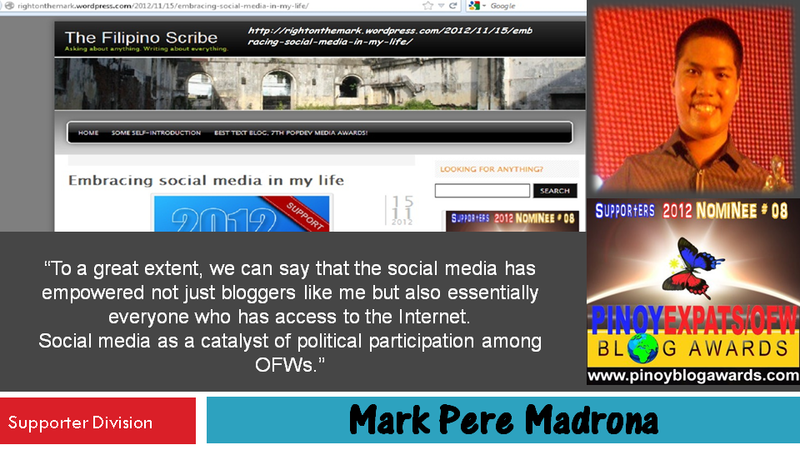 This entry was posted on Thursday, November 29th, 2012 at 12:01 am	and tagged with 2012 philippine blog awards, 2012 pinoy blog awards, 2012 pinoy expats ofw blog awards, blog awards philippines 2012, mark pere madrona, people's choice awards 2012 philippines, www.rightonthemark.wordpress.com and posted in hodgepodge, personal matters, social networking sites. You can follow any responses to this entry through the RSS 2.0 feed. 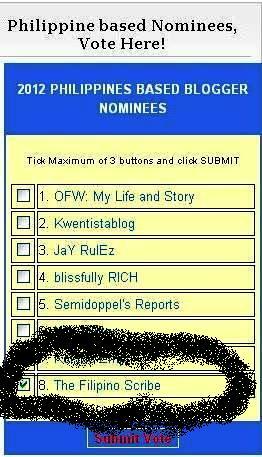 Your link on this blog page does not work but I typed the site in my search to access the voting. I just voted for you and you are in 2nd place so far. Best of luck and God’s blessings! Anyway, may chance pa. You have my prayers and support, Mark.